1. Preheat oven to 350 °F. Grease a 9-inch pie plate and place in a baking dish with a lip. 2. Filling: heat cream to just below a simmer. Beat remaining ingredients until smooth. Slowly beat in hot cream until evenly blended. Pour mixture into prepared pie plate and pour boiling water around pie plate. Bake for 20-25 minutes, until set. Let cool to room temperature, then chill custard in pie plate completely. 3. Cake: grease a 9-inch round cake pan, line the bottom with parchment, then grease again and dust lightly with flour. 4. Heat milk and butter until butter is melted, and keep warm. Whip eggs and sugar on high speed until thick and pale yellow. Add vanilla. Sift flour, baking powder and salt and add to egg mixture, beating on low just until blended. Increase speed to medium and pour in hot milk, mixing just until blended. Scrape into prepared pan and bake for 25 to 30 minutes, until a tester inserted in the center of the cake comes out clean. Let cool for 15 minutes, then turn out onto a plate, peel off parchment, then invert (so top is up) onto a rack to cool completely. 5. To assemble, slice cake into 2 layers. Stir chilled custard to smooth and spread over bottom layer. Top with second layer and chill while preparing glaze. 6. Chocolate Glaze: Stir condensed milk and chocolate in a pot over medium-low heat until melted and shiny. 7. 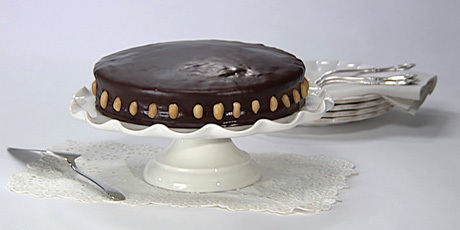 Spread glaze over cake and place peanuts along the sides of the cake.